Here’s a quick tip based on an issue I just helped someone with – when using Reaktor in Maschine, sometimes controls won’t be addressable by the knobs. What’s up with that? Usually, the knobs are mapped in pages to whatever controls are in your ensemble. Right away we can see a big problem – Max ID is set WAAAAY lower than max ID in use. Here’s how to fix that. In the ID menu, choose “sort and compress IDs”. Then, change Max ID so it’s at least as high as Max ID in use. 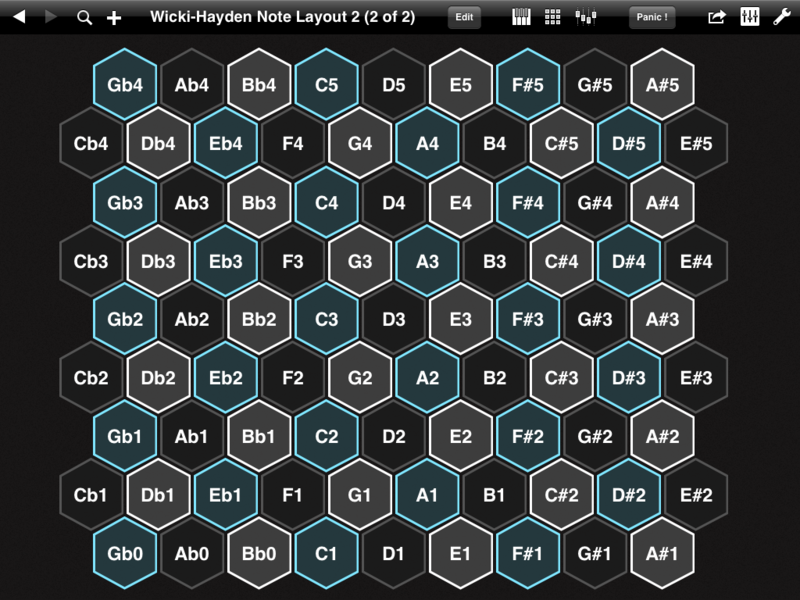 Note: this is not the same as MIDI mapping! Host automation, as we’re seeing in this example, doesn’t use MIDI CC numbers and MIDI channels. Instead, it uses a separate range of ID numbers. 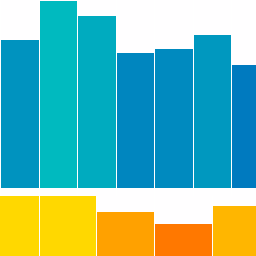 By the way, I’ve noticed that a significant chunk of people are still using Reaktor 5.8 – thanks for answering the poll question – I will stick to that version for ensembles I’m currently authoring. Eventually we all have to be dragged kicking and screaming into the present, but for now – what do we say to the god of upgrading? Not today. This entry was posted in Uncategorized and tagged control surface, Host Automation, maschine, Quicktip, reaktor, VST Automation on February 10, 2014 by peterdines. One iOS control surface that’s getting too little love in my poll on the left is TB MIDI Stuff. 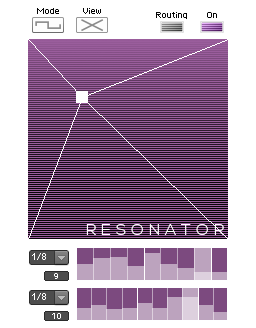 It sends and receives OSC and MIDI, including NRPN, so you can do 14 bit high resolution MIDI. It even does bi-directional Sysex. The editor is built in so there’s no need to edit your layout on a computer then sync – add, delete and modify controls and pages right on your device. There are some built in control surfaces like a standard keyboard (with arp!) 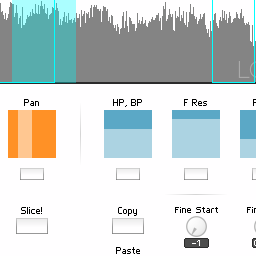 and an MPC type drum pad and many other editable templates. Get it here for only $4.99 – daaaaamn that’s cheap – and I guarantee you will find uses for it. It’s worth that coffee-and-muffin price just for the default keyboard and MPC and the Wicki-Hayden templates, to say nothing of the custom templates you can put together quickly and easily. Oh, did I mention there are built in scales and customizable scales you can play from ribbons and other objects? Well, there are. It’s a Swiss army knife of MIDI features for a toothpick price. This entry was posted in Uncategorized and tagged control surface, controllerism, iOS, ipad, MIDI, OSC, performance, TB MIDI Stuff on November 11, 2012 by peterdines. Here is the new version of Mirage featuring OSC control mappings for the awesome Konkreet Performer iPad control surface. Update: Download link now goes to version 1.9.6.1 which is the same as 1.9.6 except the Mirage instrument header is set to visible, making it easier to get into instrument properties and change the number of voices. It arguably looks “neater” with the header bar hidden but isn’t as noob-friendly. This version is free for owners of previous versions. Download here – your existing password will open the archive. The new version includes extensive feature enhancements and numerous bug fixes, and carefully thought out, tested and integrated Konkreet Performer mappings. 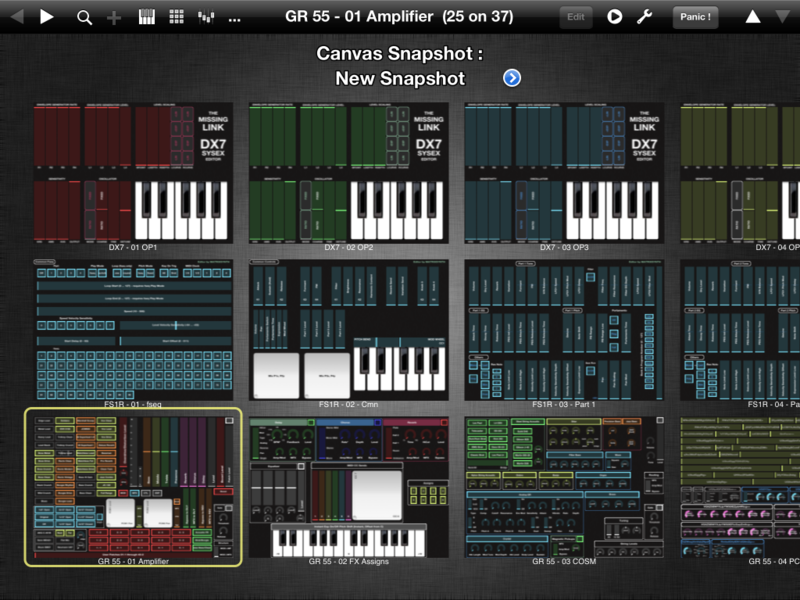 Mirage snapshot recall will also recall node positions and transmit them to Performer on your iPad. This time out the sample material is mostly one-shots to work in conjunction with the added pitch correction. Adding longer phrases and snippets of songs works well too but with the one-shots you can do something more deliberate and compose a part for a pre-existing track. I find with long phrases there are only a couple of note combinations that work well and what you come up with will have a mind of its own and suggest its own composition.There are a couple of trashed piano field recordings in here that rattle beautifully – nothing like hitting the harp directly on a piano that’s sat out in the weather for a few seasons. To use Konkreet Performer with Mirage, set up a 4 node layout with visible node labels, activate trigger hold, and set inertia to 30. When touching and moving the central node, the other nodes will slowly track and follow, creating a sort of manual LFO that slowly snaps back to the snapshot’s original settings. 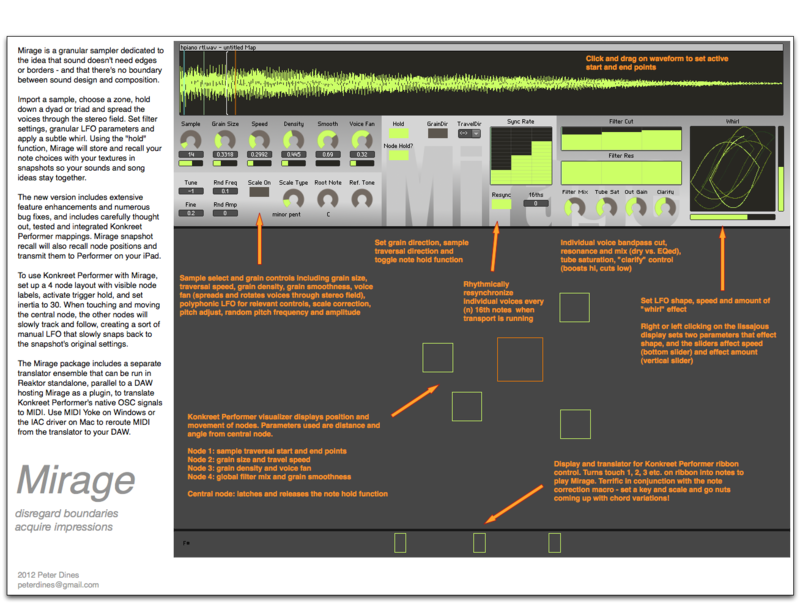 The Mirage package includes a separate translator ensemble that can be run in Reaktor standalone, parallel to a host using Mirage as a plugin, to translate Konkreet Performer’s native OSC signals to MIDI. Use MIDI Yoke on Windows or the IAC driver on Mac to reroute MIDI from the translator to your host. Or, save $$ and buy the sampler pack which includes Loupe and ParamDrum. This entry was posted in Ensemble, ensembles, granular sampler, Mirage and tagged control surface, controller, instrument, ipad, Konkreet Performer, MIDI, Reaktor 5, sampling pack on September 25, 2012 by peterdines. All reety then, after buying Lemur for iPad the other day and sifting the PDF manual for the chunky bits, I spent a few hours today crafting my first Lemur template. It’s a hybrid OSC / MIDI creation that borrows the stock drum pads, adds a sustain latch, and also five bouncing balls with individually adjustable speeds, friction and scaling. The scaling turned out to be especially important, as setting the balls loose on their full range of travel then mapping them to Reaktor controls is a bit sloppy. So using the X and Y scale controls, you can specify a range of travel for whatever control you map them to. That way, you can specify that your filter cutoff stays within a useful range, or open it up to the full range of travel for crazy wildness. The MultiBalls output both OSC and MIDI. The OSC signals look like /Multiball/X1 etc, and the MIDI CCs are in the range 17 to 26. There are X and Y lock toggles to make MIDI learn easier. There are probably better ways to address the creation of variables and math formulas than what I’ve done here, but give me a break, this is my first try! If you’re a longtime Lemur demigod, I welcome your criticisms. The HolyBallz template can be downloaded here. I’ll be adding templates more specific to my own ensembles soon. 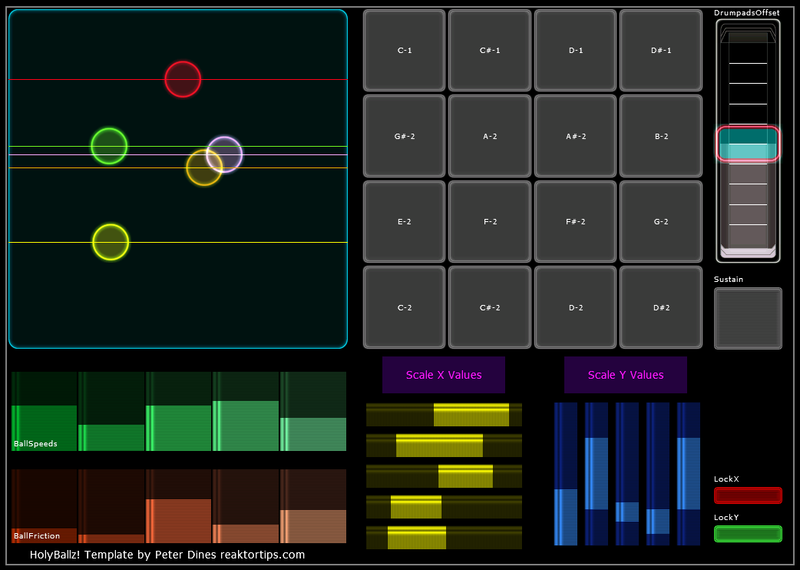 This entry was posted in download and tagged control surface, controller, ipad, Lemur, MIDI, OSC, template, touch controller, touch surface on December 11, 2011 by peterdines.